If you are system administrator at a school, college or office, then you must be looking for a good way to block social networking websites like Facebook, Twitter, Orkut etc. Or if you are a parent, then you may want to block certain websites from your computer so that you children don’t open them by mistake. The best solution would be to use some commercial software to block these websites. Another way would be to configure a proxy filter at the network gateway. Both these solutions are the good ways to block websites. But if you are looking for a cheap or free way to block websites on your computer, which is also very easy to implement, then you should use HOSTS file to block websites. HOSTS file is a text file used by an operating system like Windows to map an IP address to a host name. For example, if you open http://localhost in your web browser, Windows checks HOSTS file and takes you to 127.0.0.1 IP address. 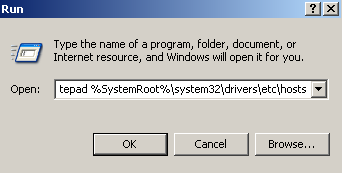 If you are on Windows vista or windows xp, go to click on start->run type, notepad %SystemRoot%\system32\drivers\etc\hosts, and press enter. After adding all the websites that you want to block, save the HOSTS file. Now open the blocked websites in your browser. You will not be able to open any blocked website now. 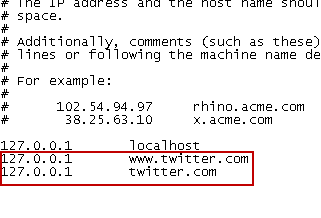 To unblock the blocked websites again, remove those lines from hosts file. Note that after adding the HOSTS file to block websites as explained above, if you are unable to save it, then you may have to open the HOSTS file as an administrator.